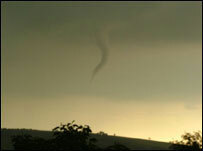 Funnel clouds have been spotted over parts of Bristol and Wiltshire. The phenomenon on Monday night was hundreds of feet high and lasted up to 20 minutes - much longer than the average two minutes. Mandy Doyle, who lives in High Littleton said: "It was the scariest thing I've ever seen. Something out of a movie." Funnel clouds are similar to tornados, but are weaker and do not make contact with the ground. Dorothy Gwinnell of Whitchurch, said her neighbour had rung her up and told her to look out the window. "I was shocked. It was very long but it seemed to be moving quite slowly. It was kind of hovering overhead for about 15 or 20 minutes." 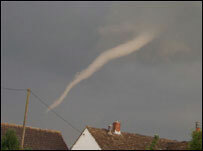 A mini-tornado was also seen passing over Trowbridge in Wiltshire. PA weather forecaster Paul Knightley said it was not technically a tornado as it did not touch the ground. "It wasn't going to cause much damage but I can imagine why people would have got excited. "We actually had three or four funnel clouds and possibly one tornado yesterday across the country." There were no reports of damage to property. It comes one week after a tornado hit Birmingham, damaging buildings and uprooting trees. Mr Knightley said Britain averaged about 33 to 35 tornadoes a year. "If we got a few more Birminghams that would make us sit up and take notice. "But people are just reporting these things more now and they have cameras and mobile phones to back up what they've seen."